U.S. yogurt sales have stalled after years of booming growth that was driven by the rapid rise of Greek yogurt. The path forward for yogurt makers remains challenging as mounting competition and consumer preferences continue to evolve. The dairy aisle is teeming with yogurt options as food companies prospect for the next gold mine in what has become the grocery store’s Wild West. There’s yogurt made from soy, cashews, coconuts and peas. Others are made from goat’s milk, sheep’s milk or cow’s milk that can either be full-fat, low-fat or ultrafiltered. There’s Greek, Icelandic, French, Australian and German-style yogurt, and varieties range from low in sugar to high in decadence. This abundance comes as U.S. yogurt sales have stalled after years of booming growth that was driven by the rapid rise of Greek yogurt — a thicker, protein-rich alternative to traditional yogurt that now accounts for close to half of all yogurt sales. The path forward for yogurt makers remains challenging as mounting competition and consumer preferences continue to evolve. Danone, Chobani and General Mills collectively control 75 percent of the nation’s yogurt market. They all acknowledge sales have recently flatlined but disagree on the cause and solution. General Mills said that consumers aren’t clamoring for Greek like they used to, and that they want something else. Chobani blames General Mills for giving up on Greek yogurt, which it said has had a dampening effect on overall yogurt sales. And Danone believes it’s because of a lack of innovation by its competitors. On one point they all agree: Bold new ideas are needed to jump-start sales again. 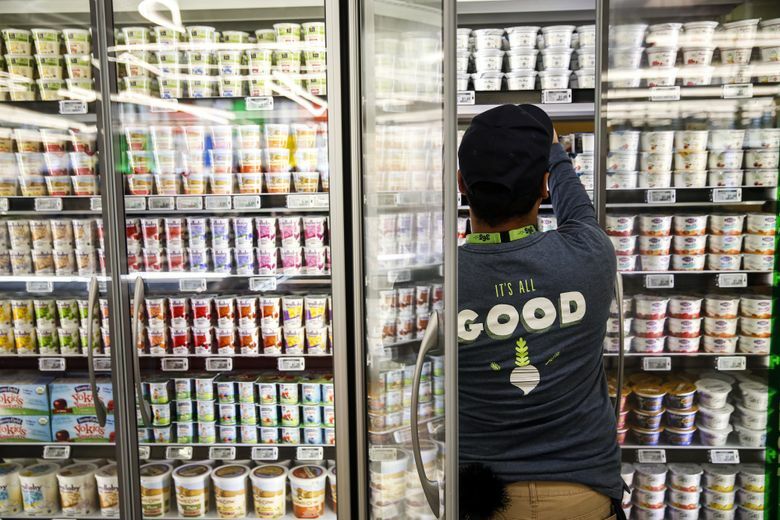 Retail sales of yogurt hit $8.8 billion in 2017 with the potential to reach $9.8 billion by 2022, market research firm Packaged Facts predicts. General Mills — which over the past year has slowed a hemorrhage in sales of its yogurt, with innovations helping its Yoplait brand — sees this moment as a chance to regain its leadership position. Chief Executive Jeff Harmening doesn’t like chasing others. The company, he said recently, does best when it comes up with its own ideas. “The reason we are able to outperform our peers right now is because we have some really good innovation,” Harmening said. That outperformance refers to General Mills’ successful first year of its French-style yogurt, Oui by Yoplait, which comes in glass pots that are distinctive from other yogurt packaging. The company experienced slight gains in yogurt market share during the most recent two fiscal quarters — the first gains in three years. This past year, General Mills lost its No. 2 market position in yogurt to Chobani after several years of lackluster performance. At its worst, the company was tallying quarterly sales losses in yogurt of more than 20 percent. By the end of this summer, General Mills had made significant improvement in the category, posting a quarterly loss of only a half-percent. Harmening attributes yogurt’s sales stagnation to recent double-digit declines in the Greek variety. He believes yogurt has a strong future because it’s a food that tends to follow health trends. “As Greek becomes less a part of the category, we think that bodes well for our position,” Harmening said. But executives at Chobani — the company that elevated Greek yogurt from niche to its mass-market status — dismiss this notion. More than 1,400 brand-flavor-variety combinations of yogurt are sold in U.S. stores today, a dramatic increase that is confusing consumers, McGuinness said. The increase has slowed the industry’s ability to move its product through store shelves. Market researchers and pundits are looking for “the next Greek yogurt,” but McGuinness said that’s unnecessary. “There are areas within Greek that need to be exploited and expanded on,” he said, like yogurts for men, better options for children and improved portable, drinkable or lower-sugar options. Both General Mills and Chobani rolled out high-protein, low-sugar products nationwide this summer. General Mills’ YQ is a traditional yogurt while Chobani’s Hint Of line is the Greek counterpart. YQ is in about 30 to 35 percent of the U.S. retail market, said Harmening, with plans to at least double that distribution. McGuinness said Chobani’s Hint Of product is “far outperforming YQ,” but he didn’t offer specifics. All the companies are watching one area particularly closely: plant-based yogurts. More Americans are ascribing to vegan, or semi-vegan, diets and are looking for alternatives to dairy. Danone North America, which sells more yogurt in the United States than any other company, is putting resources into innovating in this space. Dairy-free alternatives “will continue to command more shelf space in the yogurt aisle as dietary preferences evolve,” Mariano Lozano, chief executive of Danone North America, said in an email. Plant-based products now comprise just 2 percent of yogurt sales. But, Lozano notes, it is growing at a rate of 55 percent per year. Danone, best known for its Dannon and Oikos brands, last year bought White Wave Foods, a leader in both organic dairy and dairy-free alternatives. Now, Lozano said, the company is most focused on expanding innovation within probiotic dairy foods, premium yogurts, low-sugar and organic options. Consumers will likely see more new products hit yogurt shelves as these major players, and smaller entrepreneurial brands, look to unlock a new major consumer segment.